1. Oh, you don’t keep real kosher. I’m kidding. And I even hesitate to leave that on my blog. So, to be clear, I don’t condone violence. 2. So, you’re basically reform. This statement usually follows any discussion in which I say that Karaites only keep one day for each of the holidays (even in the diaspora). For background, in the Orthodox community, each Torah holiday (except Yom Kippur) is celebrated with an extra day. So for Karaites (like the Reform position), Passover is seven days, where as our Orthodox brethren observe it for eight days. 3. So, you pray like the Muslims. This is a classic line that I hear almost any time I describe how Karaites pray. For the uninitiated Karaites historically have prayed with full prostration on prayer rugs, without our shoes. This does indeed look like how our Muslim cousins pray. You can also respond with some form of the “pre-existing paradigm” answer from above. 4. How Can You Ignore the Rulings of the Sages? This query usually comes from religious Rabbanites. I very rarely hear it from anyone else. In truth, I used to hear this a lot more. Perhaps society is loosening up, or religious Rabbanites have their own battles to fight within their communities, so they are leaving me alone. More Thoughtful Response: “The Rabbis of the Talmud and later times were wise men, who did everything they could to praise God within the framework in which they were operating. At its core, you are suggesting an argument from authority – that is, the Talmudic Rabbis have the expertise to make these decisions, and we do not. The problem is that if I do not believe in the authority you are citing to, the entire argument falls apart. As a Karaite, I don’t believe that the rabbinic sages (no matter how wise or well-intentioned) had the power to bind me with a particular interpretation. I believe that every interpretation – even traditional Karaite ones – must rise or fall on its own merits. That should do it for now. I invite you to comment with some of the criticisms (founded or not) you have heard leveled at you for your Karaite tendencies. Are there any active Karaite groups in the Seattle area? I have been gradually moving for some time towards converting to Judaism and find the Kataites particularly worthy of investigation. and have thus not had their tribal practices and tenet beliefs corrupted by all the future generations of Levitical tribe traditions and all the historical appointed Sages and Counsels that were established from that time on, developed during their 40 year walk through the Promise Land, and then by the Sons of Aaron, et al. and are thus continuing on….to be modified and reformed and newly developed even today? This is a Historical antiquity question. And it requires Facts which I do not have answers for. Thus, it is still a speculation or hypothesis in its present query. Does anyone here have textual references for the Origins in History for Karaites. How many traveled with Moshe from Eqypt? or did they at all? First, of relevance importance to responding to our arguments of having to validate to other Jews, the reasons why we do, what and when we do them as Karaites: The mere fact of having that historical chronology of incept dates for information and responses alone would place Karaites in a position of Tenure to the practices of the Original Instructions of Torah, without the additional requirements of Sages from other Tribal Practices and origins. It would require discernment and humble prayer directly to YHVH while reading Torah instruction to receive your answer. Of course, the potential problems however in that tact of using a historical response, is that The Israelites that followed Moshe out of Egypt are the only Jews today recognized as the Chosen People and true Jews of the 12 tribes. Are there any Karaite Specific Texts that have been found in the Chosen Land that show proof of our joining the Exodus journey? Or, did we in fact stay in Egypt? and aliyah to Israel much later? Most scholars believe that the Oral Torah began to be codified between 200–220 CE pursuant to the direction of Rabbi Yehudah haNasi, There were sects of Judaism that rejected an Oral Torah that are referenced by the Jewish Historian Joseph ben Matityahu aka “Josephus” in Antiquities of the Jews frequently referenced the Sadducees circa 93 c.e. Six centuries from the codification of the Talmud passed until Karaite Judaism emerged as a movment. Karaite Judaism has its earliest roots in the first half of the ninth century during the lifetime of one of its founders Benjamin Nahawendi. Nahawendi’s Sefer Dinim in its colophone mentions the term Karaites for the first time. (See Nathan Schur, History of the Karaites” page 25 citing A. Harkavy, Studien und Mitteilungen VIII, 1903, 175-184). Nahwendi used the term Karaites to mean “Champions of Scripture”. It is true that focusing only upon the written text as the basis for Torah law clearly existed at the time of the book of Deuteronomy “You shall not add to or subtract from the Laws I have given you” (Devarim 4:2). The notion that Anan ben David started Karaite Judaism has been effectively debunked by modern scholars and has not been picked up by the internet websites who hold to the now discredited view. See, Professor Moshe Gil, History of the Karaites, p.73 in HdO: Karaite Judaism – A Guide to its History and Literary Sources edited by Professor Meira Polliack. Nowhere in Tanach does it say that there were Israelites who refused to leave Egypt and join the Exodus under Moshe’s leadership. Can anyone show us otherwise? I think that most people would agree that Karaite Judaism was the original Judaism; Rabbinic Judaism was the innovative Judaism. Rabbinic Judaism evolved as a result of the neccesity to adapt to a more modern, liberal world, as the Jews lived in a culture heavily influenced by Greek modernity and liberalism. This probably best explains why the Sadducees I.e. original Karaites existed from the very beginning of recorded rabbinic history I.e. the tannaitic era. The Karaites never accepted the idea of modernization and adaption, while the Rabbinates did. The Irony in your statement is that today, many Rabbinate rabbis are doing the complete opposite of adapting to a more modern world. They are clinging to outdated stringencies that have no place in Judaism (i.e two days of Hag) and keep pushing communities to become stricter and stricter. That is only in the Hareidi [ultra-orthodox] community, which is a small fraction of the total Rabbinate population. The Reform Rabbis are very liberal and modern–just as modern and liberal as any religious group. The Conservative Rabbis are no different. The Modern Orthoodox and Religious Zionist Rabbis are also very liberal and modern, constantly adapting to modern society. It seems that too many people are convinced of the erroneous notion that Qaraite Judaism is the original form of Judaism due to how Nehemia Gordon made this bizarre argument and has spread it far and wide. How could this argument be correct when the actual clergy in authentic Judaism are the hereditary Kohanim, Levites and true prophets (when the latter are available), whereas in Qaraite Judaism the clergy are Ḥakhamim irrespective of whether they are of the Lewi tribe? This is the main difference and it cannot be ignored. A minor difference is that in original Judaism the adherents would emphasize worship on Har haBayit (Temple Mt.) in whichever possible capacity, whereas the Qaraites have no particular urge to attempt worshiping there. Bearing all of this in mind, it is fairly easy to realize why the Sadducees are not the original Qaraites. Rabbinic Judaism, for its part, evolved as a result of the desire of the rabbis to twist Judaism into a contortion that bears similarities to foreign cultures such as Hellenism and Zoroastrianism, employing the excuse that the influences of said cultures were immense. If I understand Gordon correctly, he is saying that Karaite Judaism existed without being named, it was just Torah observance. That the Cohanim, the Sadducees, disagreed with the notion of the Oral Law adds credence to Gordon’s position. Qaraite Judaism is based on the entire Miqra rather than the Torah alone, which is another main reason why Gordon’s argument is absurd and the reality that many have fallen for it is lamentable. Gordon quotes from the entire Tanach all the time. That fact that Tzedokim (Sadducees) and Essence Jewry existed, prior to the end of the third Temple in 70 C.E. is not proof that Karaite Jews existed. To the contrary, Karaite Halakha and Tzedokim Halakha differed on substantial points and we would be doing a disservice to Tzedokim Jewry if we retroactively tried to turn them into Karaite Jews. Not all Jews who rejected a post-Sinai Oral Torah are Karaite Jews. The pressure to gain greater justification for one’s movement by creating earlier attribution is something that both Karaites and Rabbinates have both been guilty of. Exhibit A the forgeries of Karaite Hakham Abraham Firkovich (See, https://www.google.com/url?sa=t&rct=j&q=&esrc=s&source=web&cd=4&cad=rja&uact=8&ved=0ahUKEwiP3fua9JLSAhUIqlQKHRn6Au8QFgguMAM&url=https%3A%2F%2Fwww.jstor.org%2Fstable%2F23508934&usg=AFQjCNEV0c7zdtl6xiDNAiksXo6VSNrJlw) or Rabbinate Moses De Leon, 13th Century, who attributed the writing of the Zohar, which he wrote, to a respected Rabbi of a much earlier era. The Karaite Tuv Ta’am requires a declaration of belief in the books of the prophets, which would have been kind of hard to do before they were written. You scare me when you refer to the 3rd Temple in 70 CE. As for belief in the prophets somehow negating ancient Jews as Karaites, I disagree because of the ‘maturity’ or natural growth of any religion. With that being said, I would agree with him that it is ridiculous to expect the Israelites who lived prior to the composition of all the Prophet books to have automatically agreed with all their contents. The only reason Karaites “don’t emphasize worship on Temple Mt” is because we are in the diaspora. The Jews in the Babylonian exile didn’t emphasize worship on Temole Mt any more than the Karaites! Similarly, the Torah never mandated that Kohanim and Levites * must * be the clergyman of the Jewish people. It was only a * suggestion * or * preference *, being that Kohanim and Levites had to frequently be in the Temple, due to their obligatory service therein. it was always acceptable–and even practical–for Non-kohanim and non-levites to be clergyman. It is thus logical to liken the role of the Karaite hakhamim to that of the שופטים. Therefore, there are no grounds to disprove the assertion that Karaism was the original Judaism. Unfortunately for your first argument, Isaac, the vast majority of Qaraites — some 35,000 to 40,000 out of an absolute maximum of 50,000 — reside in the Land of Israel. If you wish to correct others, you really should become more informed before making such statements. Obviously the excuse you have presented does not stand. Secondly, YHWH certainly mandated through the Torah and Nevi’im that the Kohanim and Levites be the clergyman of the Jewish people, while prophets from outside of this tribe functioned in their own unique clerical position *when available*. Sorry for the strong language, yet to contort that resolution into a “suggestion” is preposterous. The proof you attempt to bring forward for your contention that Israelites from outside of the Lewi tribe (aside from the prophets) could be clergymen from the individuals who served as Shofṭim falls short since they did NOT serve in the capacity of clergymen but of military leaders and judges, except for the Levites among them, of which there was only one if recollection serves me correctly — Shemu’el b. Elqanah. Therefore, your attempt to make out the Qaraite Sages to be the equivalent of the Biblical Judges does not fly, with one exception — the Ḥakhamim who have served as judges at the Qaraite religious court in Ramle. I have just provided in a comment to Marty yet another main reason to reject the bizarre notion that Qaraism was the original Judaism — Qaraite Judaism is based on the *entire* Miqra rather than the Torah alone; this applies to both the principled recognition of all 24 books as Canonical,- which was not shared by all Sadducees and even less so by all ancient Israelites, PLUS the exegetical method on drawing from all of them for interpretive purposes. That Karaitism is based on the entire Tanach doesn’t mean it’s not the original Judaism. Judaism matured through the Prophets and Writings. The Pharisees, by it’s very name, means Separate. Separate from what? From traditional Judaism. (Replying to Marty): As far as I can see, your retort drives my point home since the adherents of authentic ancient Judaism, namely the Jerusalem-centric version of Israelitism that crystalized during the Second Temple era, did not all believe in the sanctity of all the Nakh books AND the clergymen of their period were the Kohanim & Levites plus the last few prophets. By contrast, Pharisaism was predicated on rejecting the Miqra’s dictate where only the Kohanim, Levites and even non-Levite prophets could be the clergymen. In this specific sense Qaraite Judaism is a continuation of Rabbinism rather than traditional Judaism as you’ve put it. The Cohanim had authority to call the shots within the confines of Deut 17:8 If a matter eludes you in judgment, between blood and blood, between judgment and judgment, or between lesion and lesion, words of dispute in your cities, then you shall rise and go up to the place the Lord, your God, chooses. When it came to other matters, there was more flexibility which is more aligned with Karaite thinking and not the rabbanim. Marty, I take issue with your statement that Devarim 17:8 placed exclusive authority in the hands of the Kohanim to render a judgment. If you look first at Deuteronomy 24:8 you will see the term ” הַכֹּהֲנִים הַלְוִיִּם ” i.e. The Priests and The Levites. In fact in Karaite synogogues today when Torah honors occur, they are given in the order of the Kohen, Levite and Y’israeli in that order. Reading Devarim 17:8 it should be clear that a three judge court is intended. A two judge court makes no sense. The three judge court is to consist of a Kohen, Levite and a third party from any tribal affiliation. Thus, assuring at least a 2-1 verdict. The fact that at least a quarter of the entire Karaite population is in the diaspora, in addition to the fact that the Karaite population is tiny, makes it impossible for the Karaites to just rebuild the temple in Jerusalem; it’s not so simple and easy to build a temple in Jerusalem. Therefore, I don’t believe that the Karaites choose to not dedicate a temple in which they can worship. If they were able to rebuild the temple, they would. This is surely no excuse! Secondly, when I said “clergymen”, I meant people who educate and judge the people. There is no question that the Torah considered Koanim and Lewiim the preferred ones to educate and judge the people. However, there is no question that there were Non-kohanic and non-levitic Judges. And there is no question that there were also educators who were non-kohanic and non-levitic. For the זקנים of every generation, whose job was to educate and judge the people, presumably weren’t just Kohanim and Lewiim. According to this interpretation of the word “clergymen”, there were many non-kohanicand non-Levitic clergymen. The only thing that would separate a Kohen and Lewi from the judges and זקנים is the fact that the former would practically always be in the Temple and do the service therein, while the latter wouldn’t. Thus, the role of a Karaite Hakham to judge/educate can be paralleled to the Judges’/Elder’s role to judge/educate the Jewish people. (Replying to Isaac:) You become emotional which makes you fail to see what I was actually arguing and then you get carried away. I was talking about worshiping on Har haBayit to whatever extent is possible, which obviously does not necessarily include building the Third Temple. As one who ascends there on the Ḥagim I do the best I can even if it is very little and seemingly insignificant. That at least 10,000 Qaraites live abroad does not detract from the ability of Qaraites living in Israel to ascend and do what I have been doing there in terms of worship. While the Qaraite Ḥakhamim serve as educators among other capacities, the Torah and Prophets entrusted this task to the Levites & Kohanim. At the same time, while the Torah and Nakh authorized the kohanim to serve as judges, this capacity is not unique to clergymen. You have done well to bring up the Zeqenim, since it is crucial to clarify that the Torah tasks them with being sidekicks to the Kohanim. Another matter is just how long and frequently could the Kohanim & Levites serve in the Temple. While they were all needed during the Ḥagim (pilgrimage-Feasts) to handle the people’s offerings and tend to other necessary duties, they would serve only a few weeks in the Temple on top of these Mo`adim since there were very numerous from early on and accordingly, the Temple could not provide employment and lodging space for all of them at any one time on weekdays and mere Shabbatot. If Qaraite Judaism actually intended to be the direct continuation of original Judaism as it existed by 390 BCE (when all the books of the Miqra had been authored), its early Ḥakhamim would ensure that the majority within their ranks were Kohanim & Levites, while the other Ḥakhamim would only be recognized as Sages starting from a given ripe age where a Jew is recognized as a Zaqen (Elder). The Sadducees were not the original Karaites any more than the disbanded 1898 Trenton (New Jersey) Nationals, one of the first Professional Basketball teams in the USA, were the predecessor in interest to a current NBA team. (New Jersey doesn’t have a professional basketball team.) In fact, Karaite Sage, Hakham Yefet ben Eli ha-Levi, Sahl ben Mashliah’s contemporary, called the Sadducees “contemptible” (See, Poznanski, “Anan et ses Ecrits,” 171-172. See also Revel, “Karaite Halakh,” 8, n.13). Much of Karaite Halakha comes from Egyptian, Crimean, and Turkish sources which to this day have not been translated. It is very difficult for former Orthodox Jews (such as myself) who have not been exposed or raised with the Karaite ‘sevel ha-yerusha’ to know what those customs are. Hence, many are TaNaKh only, whereas Karaite Judaism as observed by the historical Karaite communities do have traditions which do not conflict with the TaNaKh but supplement it. Chief Rabbi Moshe Yosef Firrouz, for example, has written a paper on Karaite customs regarding fasting. First: Built by King Solomon in the fourth year of his reign (See, 1 Kings 6:1) circa 974 BCE. Fourth Temple: This is more controversial. In the “Holy Temple Revisited” the Bar Kochbar coins are displayed showing a Temple facade, with years One, Two and Three printed on the coins. Sacrifices resumed during that time, and Rabbi Akiva was (for a time) convinced that Bar Kochbar was the Messiah (a fact that is consistent with the building of a Temple. When the Emperor Hadrian defeated the Bar Kochbar forces they renamed Jerusalem “Aelia Capitolina: which became a Roman colony, built under the emperor Hadrian on the site of Jerusalem, which was in ruins since the siege of 70 AD, leading in part to the Bar Kokhba revolt of 132–136 AD. Aelia Capitolina remained the official name of Jerusalem until 638 AD when the Arabs conquered the city. The Bar Kochbar Temple was converted into a pagan shrine and stood until Roman became a Christian nation and the Emperior Constantine order the destruction of pagan Temples. There isn’t an “original” Judaism no matter what you call it. No such institution ever existed in the whole history of b’nei Israel. The idea that Karaites are a non-existent original Judaism is akin to the Islamic stance that the patriarchs and Moses were all Muslims. It’s word semantics. Muslim means submission to God therefore those who submitted to God in ancient times were in fact Muslims. Likewise, Karaite means to follow the p’shat of Mikra so therefore since the early Hebrew followed the Torah (a debatable idea) then they were Karaites. It’s an anti-intellectual argument which attempts to distort the nature of historical reality to favor one’s own modern nostalgia. Hi, I’m puzzled by the picture of Karaite Jews praying. Why are they wearing a kippah? It’s not in the Tanach nor are head coverings standard in ancient murals of Jews. Also, why are they wearing a tallit? Yes, we should be wearing tzizit all the time and they must be visible, not tucked into our pants. And if the worshipers were wearing tzizit, there is no need for the tallit. Marty,- unfortunately, Jews at large have been socially and culturally conditioned somehow that wearing a Ṭallit and a “Ṭallit Qaṭan” are the only ways to don Ṣiṣiyot on oneself. If there is a problem with the Kippot in such a Qaraite setting, in my view it is that the traditional Qaraites made headcovering mandatory in the synagogues. Karaite Judaism is not a sola scriptura movement (which is actually a tradition in itself, but I digress). Karaite Judaism has its own traditions on how certain mitzvot were kept, it has its own sages, and its own culture. Are any of these sages beyond reproof? Are any of the traditional means of keeping the mitzvot given at Sinai? Is the “culture” written in stone for all time? Nope, none of these are the case. As for a kippah and a tallit, Karaite Judaism is part of the Jewish religion. These are traditionally Jewish elements of worship. Before kippahs, they wore a fez. Before a fez, it was a turban. Before a tallit, it was one’s primary kanfot (garment) that was frequently what they wore everyday, just as Jews pray in these everyday. These elements remind Jews that they were (and are, in a regard) wanderers. The kippah (today’s spiritual turban) and tallit (today’s spiritual protective kanfot — now spiritually rather than physically) are the uniform of a wanderer, a stranger, and even an eved. We’re commanded to never forget when we were evedim in Mitzrayim or strangers in the Land. Donning these when we pray return us to our roots and the core of our souls. Ken, this is a very original attempt to explain the use of these religious articles by traditional Qaraites, but it is not a Qaraitee one and not what was actually intended in head covering for worship purposes in Qaraite Judaism. The female Qaraite Jews (who do not wear a Ṭallit) are deprived from a physical reminder in their apparel that they are wanderers? Head covering in particular was introduced at the outset in (traditional) Qaraite Judaism in order to express the notion that the worshipers are equivalent to the kohanim (priests) who ministered in Bayt-YHWH in Jslm. and were commanded in the Torah to don a form of headwear, whereas headcovering for worship purposes is NOT part of our ancient Israelite roots where lay Israelites are concerned. And while the traditional Qaraites decided to employ the Ṭallit in their prayer services subsequent to the falling out of vogue of four-cornered garments for daily use, they do not rationalize it as an attempt to remind the male Qaraite worshiper that he is a wanderer. I think we have a very different understanding of ‘wander’ as used by the verse. Numbers 15:39-40 This shall be fringes for you, and when you see it, you will remember all the commandments of the Lord to perform them, and you shall not wander after your hearts and after your eyes after which you are going astray. So that you shall remember and perform all My commandments and you shall be holy to your God. So tzizit are meant to remind us of the Law when we’re tempted to stray. In fact, this law comes right after someone is stoned for violating the law, gathering wood on Shabbat. I don’t see the connection with us being wanderers as in ‘without a home’, or slaves, for that matter. As for the kippah, it was a rabbinic invention during the Talmudic times. I suggest letting one’s tzizit be visible instead. The correct rendition of the words “w’Lo Tatutu” (ולא תתורו) is “that you do not go scouting-around”. And you are correct in failing to find a relation between this Pasuq to the concept of being homeless, slaves and wanderers. Derash is a Rabbinic exegetical device which easily yields conclusions contorting and unrelated to the matter at hand. It starts off considering Rabbinical sources and then delves into Scriptural sources. It’s an interesting article but it doesn’t make the case that a head covering should be halacha. What should distinguish us with clothing is tzizit. This is my explication about not boiling a kid in the motherr’s milk. First , as for the ones who do read and know the Tanakh, YHWH uses many times metaphores to express his thoughts or will. Regardind the subject mentioned above we need to understand that our ancestors did not have technical words to talk about the liquid where the little one grows (amniotic liquid)In his mother belly. Our ancestors called also that liquid milk since they knew that the little one was drinking it and grew.consequently inside the mother’s belly. An animal is not Kasher if he’s sick or if he went through a lot of suffering before its death , like cruelty, severe abuse, hunted and wounded., etc..
What i believe God is saying is to not cook or boil an animal that is pregnant. Even if the mother is dead, it takes some time until the baby animal also dies. If the animal is cooked or boiled while pregnant and the baby animal is still alive, this is plain cruelty and the baby is trapped and suffers before he dies. At several occasions YHWH, said that an animal that gives birth has the right to enjoy her baby for a little bit more than a week Before the baby can be taken away from the mother. I read that archeologists found actual recipes from pagan temples where boiling a kid in its mother’s milk was a favorite ritual and so thought is that is why it’s forbidden in the Torah. God didn’t want us imitating this particular ritual. This was claimed only about the Canaanite tablets from Ugarit, but this argument was ultimately shown to be very lacking and was thus refuted. This leaves us with no concrete evidence that Canaanites used to cook a kid in its mother’s milk for ritual purposes. I agree with Zvi. I am not convinced by the argument. “Argument from authority” is the worst, greatest and most prevalent intellectual disease and is so common among religious people, in general. I can definitely attest to the prevalence and magnitude of the existence of this disease in the Hareidi [ultra-orthodox] community. Fortunately, this doesn’t exist in the Karaite community nor in the Zionist and Modern-orthodox community. I have trouble calling myself a Karaite, as I am a convert to (a rabbinic form of) Judaism, as is my father. A lot of people call themselves Karaites today without knowing any history of the movement and the fact that until recently, being a Karaite meant belonging essentially to one of several ethnic groups (Egyptian, Eastern European etc.) each with their own customs and traditions. I like the reform comment because I get that one a bit. Truth is, despite the differences, I don’t see myself as at odds with Orthodox Judaism, but as an ‘orthodox’ (i.e. correct in approach to the faith) Jew myself. My father and I believe in Tanakh primacy, as compared to those who say (almost always non-Jews from evangelical backgrounds) they believe in “Tanakh Only” (in my experience, the last group tends to also believe that they are true ‘Hebrews’ and that Jews are in rebellion to G-d, usually for following customs and traditions handed down for generations). It is hard to explain both to liberal Jews and to curious non-Jews, that I take my religion as seriously and with about as much precision as an Orthodox Jew does. We pour over texts and look up words and how they’ve been interpreted and used and we make decisions based off extensive thought and concern (and with a strong leaning towards tradition in my case). I think it’s hard for people to understand that just because I don’t have payos and wear a fedora that I believe in and take my Judaism just as seriously and reverently as those who are more visibly distinct. Me and an Orthodox Jew disagree on authority, but we both take the Torah with the same seriousness, and in some cases, despite the stereotype, we take it more serious than commentators they defer to. Wait, so you’re not Karaite, Reform nor orthodox? Is that correct? Are you part of a Jewish sect you founded yourself?? Isaac: Most Jews I know do not fit into just a single mold. Usually, despite attending a synagogue of a certain sect, they share the views of multiple Jewish sects. I include myself among these. But don’t be concerned with necessarily being able to check-box one particular sect. I’ve semi-jokingly been given the nickname “the Karadox Paradox” because of my affinity for Rabbinic halacha while staying within the boundaries of Karaite halacha. One example is that, while my wife and I hold to the Karaite idea that one should not let a flame burn on Shabbat, we enjoy lighting our Shabbat table with battery-powered LED candles that simulate a flame’s flicker for ambiance. Sometimes I’ll pray with the local Rabbinic minyan (being careful not to make any brachot for things not commanded [such as handwashing, etc]), but not as often as I pray with a Karaite group online throughout the week in a traditionally Karaite prayer service. I’m just Jewish. I guess I’m traditional, but the Tanakh is my primary guide to how I live and believe. The traditions never bothered me for years, until I looked at the origin and realized how much rabbinical authority was the reason behind different customs. I don’t mind Sabbath candles, but the blessing and the history of the blessing and why it was instituted bothers me too much to say it anymore. Yet I still sing Shalom Aleichem because I like the song and don’t mind the midrash behind it. I live in a rural community and regularly attend Torah study with (mostly) Jewish converts at a reform temple. We are all Jewish, some are Reform, some identify as conservative (I sort of do), a couple of people even managed a conversion with a Lubavitcher rabbi twenty five years ago (which couldn’t be done today since they didn’t move to an Orthodox area). So we are a small but ideologically diverse group of people. We are just Jewish. The temple is reform because that’s what most rural communities are, but the Jewish population (especially those of us who converted) comes from many perspectives. Even at Torah study, every type of Chumash from every movement (Stone, Plaut, Hertz, Etz Hayim, Tanakhs with no commentary) is used by our small group. So I am just Jewish. 24 And My servant David shall be king over them, and they all shall have one shepherd; they shall also walk in Mine ordinances, and observe My statutes, and do them. And they shall dwell in the land that I have given unto Jacob My servant, wherein your fathers dwelt; and they shall dwell therein, they, and their children, and their children’s children, for ever; and David My servant shall be their prince for ever. Moreover I will make a covenant of peace with them–it shall be an everlasting covenant with them; and I will establish them, and multiply them, and will set My sanctuary in the midst of them for ever. Moreover I will make a covenant of peace with them–it shall be an everlasting covenant with them; and I will establish them, and multiply them, and will set My sanctuary in the midst of them for ever. And the nations shall know that I am the LORD that sanctify Israel, when My sanctuary shall be in the midst of them for ever.’ 37:24-28. A 2010 a report released by the Israel Central Bureau of Statistics showed that 42% of the Israeli Jewish population is secular. Are they seeking the Lord? Now is not the time for men to rebuild the 5th Temple. Must a Karaite Jew believe that when the Temple is rebuilt there will be animal sacrifice ?I and most Modern Orthodox find this impossible to believe in our day and time !!! I follow the Karaite tradition, but I ran up against much oposition because I am and my entire family have been vegan for generations .We certainly have no intentions to be otherwise.This fact seems to go against everything most Karaites believe. I question this idea to the core. Karaite Judaism is part of the Jewish religion, there were many Jewish groups have the same ideas in the first Jewish kingdoms, Karaite is older than Anan Ben David in the 8th century, may be it get some fame in hes time. I have been told by many Karaites that when Messiah comes it will be mandatory to partake of the Passover Sacrifice.I have contacted some of the leading Torah Scholars living today , and most agree this is not necessarily correct.I have proposed several questions that may seem trivial to you,but are pressing questions to many Torah Scholars who are very sympathetic to the otherwise beautiful Karaite Tradition. I know many Rabbinical Students who would have come over to the Karaite Way,but have been shunned because of these beliefs. I find in dealing with many of your contemporary leaders,it is best not to express your true views and opinions. I find this is very unfortunate when many of these outstanding scholars would be such an asset to the Karaite Movement. One tremendous problem with your Karaite Website in the U.S.and its Leaders, is your approach is to reach out to disenfranchised so-called Christians ,and not with highly educated Rabbinical Jews who would be an asset to the Karaites. I have had to confront this embarrassing situation for my entire teaching carreer. I have given up completely on this issue ,and see no end in sight to correct this pressing pronlem. The young up coming Jewish leaders simply don’t know where to turn, and many give up all interest in Karaism. This is what I am seeing on many university campuses in their Jewish Study Programs. First: A note on headcovervings. 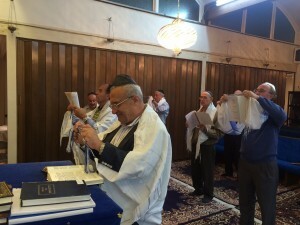 The Torah informs the Jewish people that we are to be “a nation of Kohanim (priests) and a holy people.” The Torah also commands the Kohanim to wear headcoverings during prayer. The Kohan gadol (high priest) wears a special headcovering. Since it is a goal of the Jewish people to become a nation of priests, it is not out of bounds for Jews to wear head coverings as a tradition to seek a greater level of holiness. I agree, it is not a commandment. When our Temple stood it was not mandatory to take part in the passover sacrifice and there is no reason to believe that it will change upon the appearance of the Messiah, i.e. the whole point of Pesach Sheni was to offer a second chance to those who were disqualified from participating in the Passover sacrifice. I do not understand what you mean when you write: “One tremendous problem with your Karaite Website in the U.S.and its Leaders, is your approach is to reach out to disenfranchised so-called Christians ,and not with highly educated Rabbinical Jews who would be an asset to the Karaites” because it is based upon a bizarre premise, that Karaite Jews need Rabbinical Jew to explain Judaism to disenfranchised Christians. Since our scriptures teach “God is near to all who call upon him in truth”, I am at a loss for words as to why you feel you do not need to be truthful when dealing with Karaite Jews. Ref “Since it is a goal of the Jewish people to become a nation of priests, it is not out of bounds for Jews to wear head coverings as a tradition…” It’s an interesting point, however, the Torah commands Cohanim to wear shatnez, a mixture of wool and linen, in their belt whereas the rest of us are forbidden from doing so. Another problem with the premise, be a nation of priests and therefore wear a head covering like the Cohanim; If the other tribes should wear a head covering, why not wear the entire outfit of the Cohanim? I am not familiar to the reference requiring the Kohanim to wear Shatnez, can you please provide it? Thanks. Ex 28:5-6 They shall take the gold, the blue, purple, and crimson wool, and the linen, and they shall make the ephod of gold, blue, purple, and crimson wool, and twisted fine linen, the work of a master weaver. From wiki: Rabbinic Judaism maintains that shatnez was permitted in the case of the avnet (Kohen’s girdle), in which fine white linen was interwoven with purple, blue, and scarlet material. According to the rabbis, the purple, blue, and scarlet were made from wool and interwoven with the fine linen. Karaite Judaism maintains that the purple, blue, and scarlet materials must also have been made of linen, since the Torah prohibits wearing garments made from combinations of wool and linen. The Torah does not state from what materials the purple, blue, and scarlet threads were made. The hebrew word your translation is using for linen is “שֵׁשׁ ” (shesh) is according to Strong’s Concordance 8336 properly translated as ‘byssus, so called from its whiteness, both that of the Egyptians Gen. 41:42, Prov. 31:22 and of the Hebrew Priests, Exod 26:1, 27:9, 18; 28:39. (This word, as we have seen, may be referred to as Hebrew origin; it nearly approximates however to the Egyptian (word) and perhaps the Hebrews may have so imitiated the Egyptian word, that it might also seem to have an etymology in their own language.) See Celsii Hicrob. ii. p. 259; Hartmann’s Hebraerin, iii. p. 34 – 46. It should be obvious that the wearing of a white garment, i.e. byssus – is not in and of itself a Shaatnez violation despite what Rabbinnic Judaism may think. I use the Chabad site’s translation with Rashi and I think it’s the Masoretic text. Also, ‘linen’ is the way I’ve learned it in the past though that doesn’t make it right, just popular. I’m also skeptical about the Torah instructing us to use tref animals for religious purposes, whether it’s a mollusk for the Cohen’s garment or the ‘Helizon’, a snail, for the blue of tzizit, especially when the Talmud tells us you can’t tell the difference between the blue from the shell fish from the plant, indigo…but tzizit is another story. Which is more dubious, using tref or shatnez? Since שֵּׁשׁ isn’t used in modern Hebrew to refer to any type of material, at least as far as I know, I don’t have a problem accepting Strong’s Concordance but I’ll put it on my list of things to discuss with my chavruta. The bottom line is it doesn’t affect my comment that there is no need to wear a kippah and as I recall, you concur. That the Cohanim were instructed to wear a turban and we are to be a nation of priests doesn’t mean we should dress like them, otherwise, as I said, why not wear the same outfit, bells and all? ‘You shall be a kingdom of priests and a holy nation’ just refers to obeying the Law, setting the right example, agreed? When two interpretations are equally possible, one pointing towards innocence and the other towards guilt, common sense dictates that you accept the interpretation that points towards innocence to avoid laShon hara. (BTW this is the circumstantial evidence instruction given in every jury trial in an Anglo-Saxon country). 30 And David went up by the ascent of the mount of Olives, and wept as he went up; and he had his head covered, and went barefoot; and all the people that were with him covered every man his head, and they went up, weeping as they went up. The sevel hayerusha, i.e. the Custom, of the Karaite Jews to cover their heads during prayer is not without biblical precedent. The old and ancient Greek in the LXX tanslated by Jews more than 2000 years ago use the word βύσσου which is transliterated as bissou, bissos and means linen, just pointed it out for info. Of. Ourse they would not use non kosher animals to get the blue color . They used dried flowers , the blue hyacinth most likely was used to get the blue. It was easy to carry, could be kept for a long time in a little jar or container. They took warm or hot water , mixed the dried flower powder with the water, inserted the garment or anything else, stirredit for a certain time , took it out and let it dried. Some of those dried flowers were carried out of Egypt during the exodus. Where do you get that they used dried flowers? I think it’s chapter 4 in Menachot where “techelet”, the blue thread, is discussed. The plant referenced is indigo which the rabbanim say its blue color is indistinguishable from the blue produced by the “Helizon”, a shell fish. But the rabbanim say that we can’t use the plant because its color fades whereas the blue from Helizon doesn’t fade. Yet, the rabbanim mention that indigo is used for the priestly garments because it’s okay if their clothing fades. I don’t buy the rabbanim’s argument. Better to use a plant that fades than an unkosher animal. Just dye it again as needed. I doubt that that dye obtained from a plant is that expensive but I don’t know. I get it from 2 sources regarding the blue color. One is from Josephus antiquities of the Jews Book 3 chapter 6.1. The other one is with humbleness I have an extent knowledge of ancient Greek specializing in the LXX, translated by Jewish scholars from Hebrew to Greek about 2000 years ago . The ancient Greek use the word blue as ὑακίνθου, transliterated as Yakinthou , Hyacinth in English which is the name of the flower which the blue dye color is taken from. When I post something it is not to create a stir or polemic about something, It is to share things that may trigger some thoughts in somebody’s mind. Another thing it is easier to carry dried flowers than shell fish and in case it was shellfish (which I doubt since nothing unclean can come close to God), where would you find shellfish in the desert? As you can see, it says they brought the flower for purple and white but it doesn’t mention blue. Ref Hyacinth: I use Art Scroll’s Talmud and the English said Indigo, either way they are both plants. I’ll be there next week and check what the Aramaic/Hebrew term is. I also wondered where do they get shellfish in a desert? I don’t know but I would guess that from time to time they wandered by the seashore. I don’t know why you said that. I’m guessing either you were worried how the reader is perceiving you or perhaps you think I said something in anger or sarcasm?? Either way, I’m enjoying the exchange. I think we’re both being respectful to others and debating interesting points. I enjoy the exchange , it is very informative and uplifting. It is just that sometimes people are writing things to stir up an argument for the sake of it. I am also a bit like Moses, I do not express myself very well and sometimes I am misunderstood. Bottom line they use dried flowers to dye most of the things which is more acceptable than any unclean animals or things. Exodus 26:14 mention in the JPS “a covering of sealskins above while the LXX makes no mention of it but instead use blue skins above. Anyway, the covering with unclean animals (seals)doesn’t sound right. Again, where would seals come from ?I am not sure if the red sea would have some. I think we also dealt respectfully to those exchanges. Regarding :The hebrew word your translation is using for linen is “שֵׁשׁ ” (shesh) is according to Strong’s Concordance 8336 properly translated as ‘byssus, so called from its whiteness, both that of the Egyptians Gen. 41:42, Prov. 31:22 and of the Hebrew Priests, Exod 26:1, 27:9, 18; 28:39. (This word, as we have seen, may be referred to as Hebrew origin; it nearly approximates however to the Egyptian (word) and perhaps the Hebrews may have so imitiated the Egyptian word, that it might also seem to have an etymology in their own language.) See Celsii Hicrob. ii. p. 259; Hartmann’s Hebraerin, iii. p. 34 – 46. Well the old and ancient Greek word in the LXX translated by jews from hebrew to greek for linen is “βύσσου” , transliterated in English as bissou, bissus. How does the Karaite Movement view Torah Criticism? I am curious as to the reason why Karaite Jews even consider wearing the Kippa, since this is a rabbinical ma’asim and is not found in the Torah. The only ones to wear head pieces were Aaron and his sons and thereafter the Kohanim. Q: Do you pray like the Muslims? Karaite Jews do not pray like Muslims, and Muslims do not pray like Karaite Jews. Yes, there are similarities in that both groups prostrate themselves…but from their the similarities end. Karaite Jews wear a 4 cornered garment with tzitzit of two different types of coloured thread. There is a world of difference between going to a Mosque and a Karaite Synagogue. Muslims do not pray in hebrew. Not even in Israel. I agree with you in part. Yes, I see mercy as one main component. I see abstinence from the Pagan fertility ritual of that period, which involved boiling a baby goat in its mother’s milk as a purported method of gaining fertility from the favor of the gods, as another, vital component. I understand that Karaite Tevila needs to be in natural water not an artificial mikva. Do you also require full body immersion ie that the head including all the hair be fully submerged? karaites requires running water. It can even be a shower. No requirement for full submersion. The requirement generally is to wash.